Skull long, not too narrow with prominent occiput. Foreface long with punishing jaws and slight stop. The skull well balanced and surmounted by a long "top knot". Nose preferably black, but liver is no fault in light coloured dogs. Not too short. Set on low with ring at the end. Raised when in action. Sparsely feathered. Long and very fine texture on ribs, fore- and hindquarters and flanks. 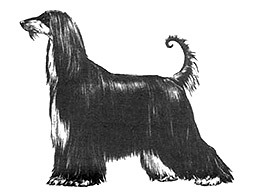 From the shoulder backwards and along the saddle, the hair should be short and close in mature dogs. Hair long from the forehead backward, with a distinct silky "top knot". On the foreface the hair is short, as on the back. Ears and legs well coated. Pasterns can be bare. Coat must be allowed to develop naturally. Skull too wide and foreface too short. Large, round or full eyes. Neck should never be too short or thick.